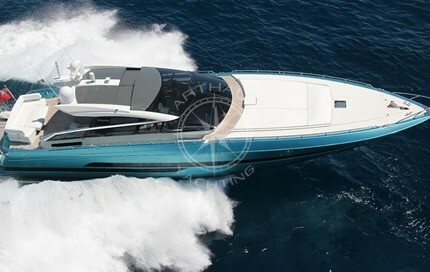 Spacious and original are the words that come to mind when you think of the rental of the Superfun yacht. Spacious and stable : two words that come to mind when you think of the 40m Cantieri Russato motor yacht Superfun. 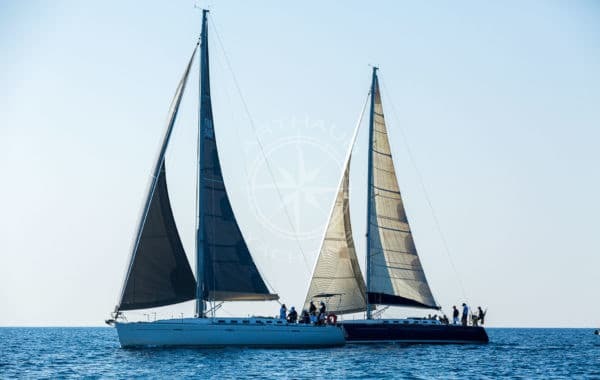 This spirit of tradition yacht built in 1993, has since had a refit in 2007, based on the renowned Feadship design, she features the advantages of the era with her spacious deck arrangements, completed with a modern yet homey interior and superb stability behavior due to her recent draft and installed stabilizer equipment. 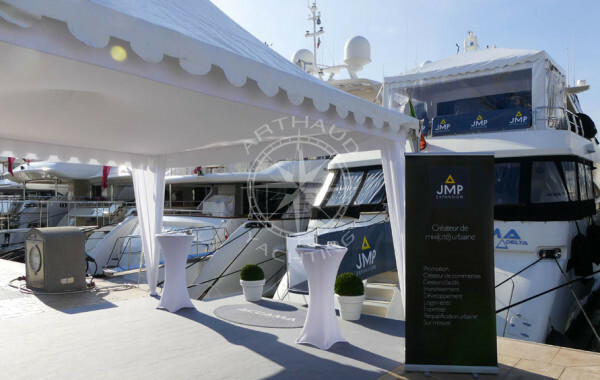 Her immaculate white hull, majestic triple deck, and interior design courtesy of F.Marquet have seduced a multitude of clients whether for private charters at sea, or corporate quayside events. 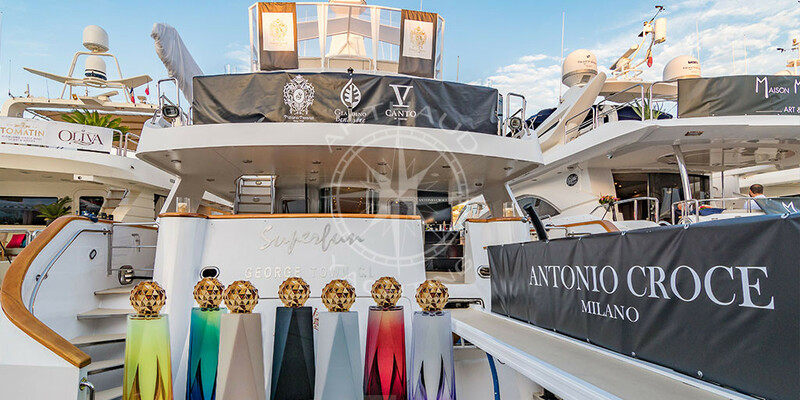 Motor yacht Superfun puts at your disposal a selection of on-board facilities and services which are sure to ensure unforgettable moments during your time aboard. 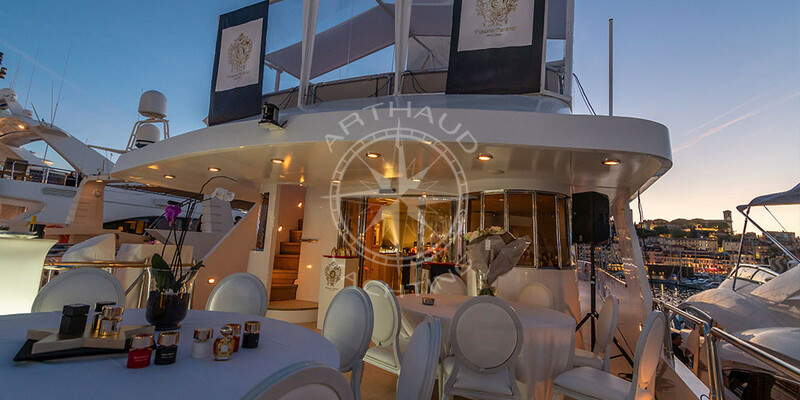 Managed and maintained by an international crew with eight full trained members, this floating palace will mark the memories of any charter party. 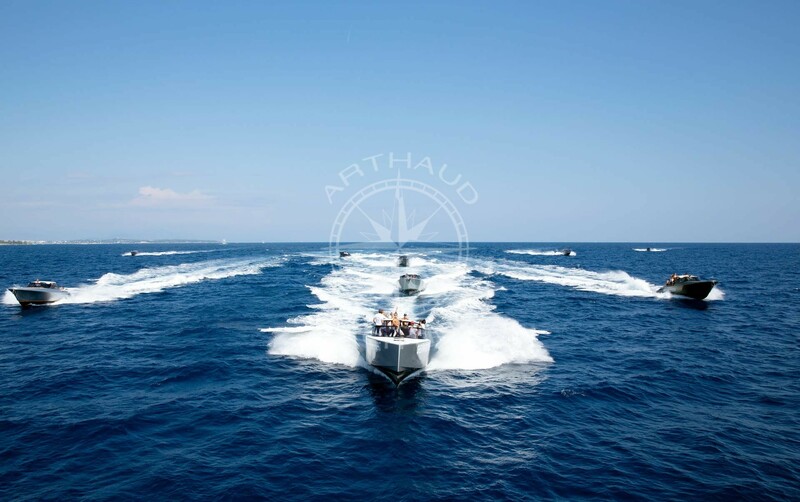 Available to discover the Mediterranean Sea, her operating areas include the South of France, Amalfi coast, Corsica, Sardinia; you can let your imagination run wild and motor yacht Superfun will take you to the destination of your dreams in a smooth and quiet manner. 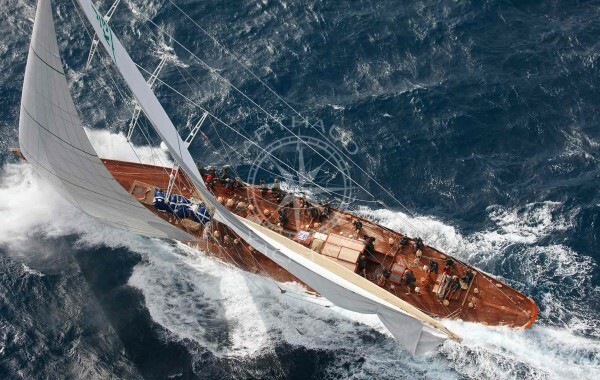 She has a proven track record as a fully equipped motor yacht and is a tried and tested world cruiser. 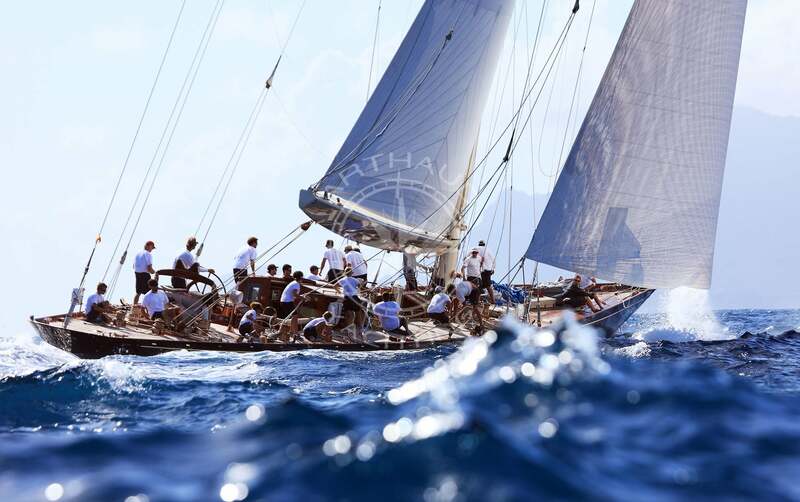 Qualified crew at your service on the yacht M/Y SUPERFUN for hire. A capacity of up to 10 guests in five cabins. 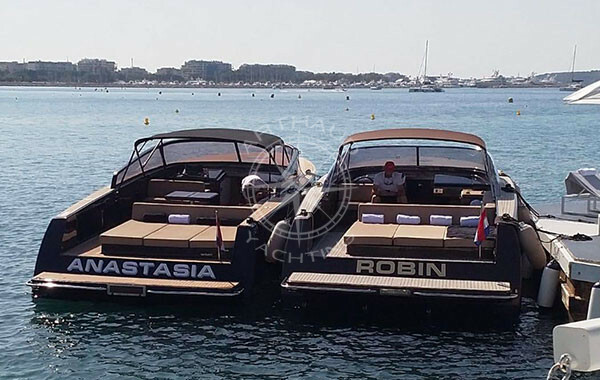 With the possibility to accommodate up to ten guests in five different cabins, you can embark with your friends or family for a charter in a relaxed and sophisticated atmosphere. 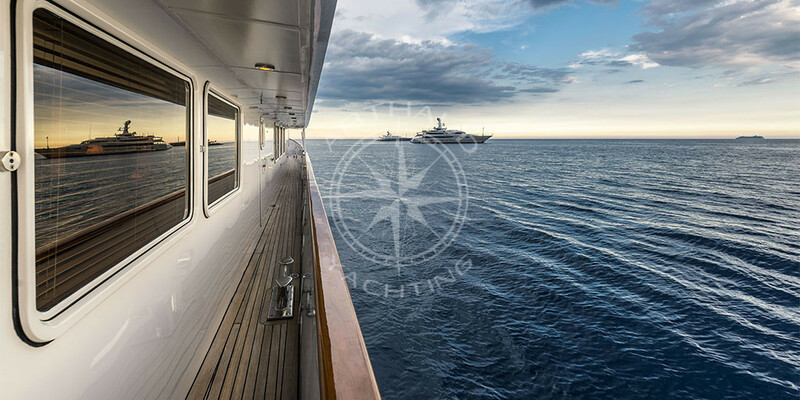 The entire bridge deck of this floating beauty is dedicated to the master suite, her master deck aft features a private terrace perfect to enjoy a tranquil breakfast or glass of champagne before dinner. Completed with an interior gym, the bridge deck is ideal for anyone looking to relax and keep in shape throughout their stay. An additional three double suites, and one twin cabin, all furnished with shower rooms are located on the lower guest cabin deck. Each guest cabin is equipped with the latest entertainment and communication system, as well as ample wardrobe space. 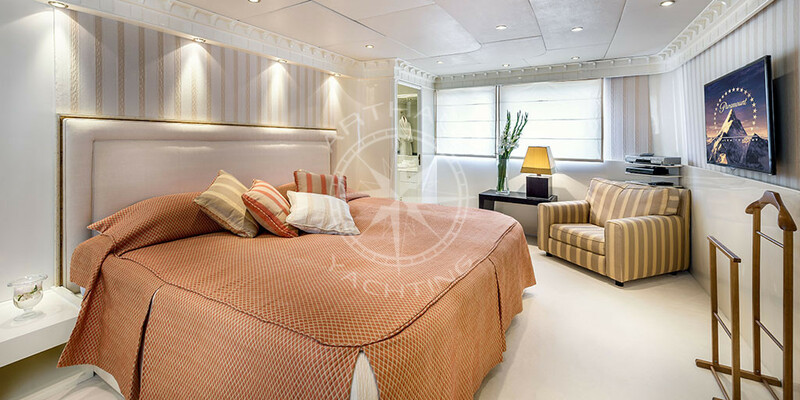 All the cabins on motor yacht Superfun feature excellent headroom and are beautifully finished in light tones and imperial marble. 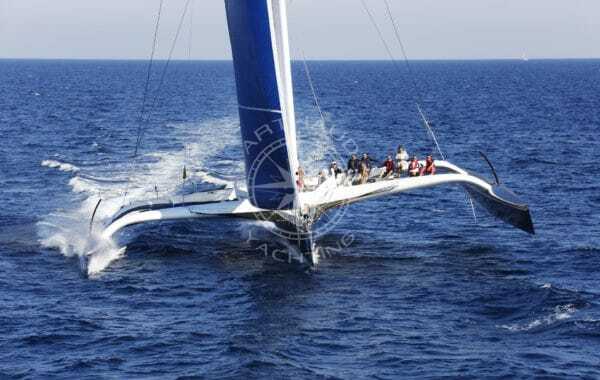 Once you embark you will feel right at home, leaving all your worries on land! 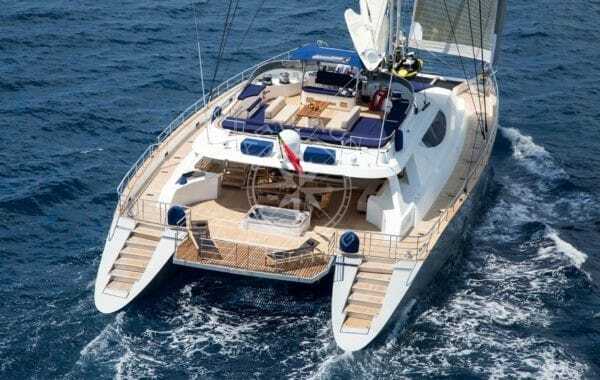 On-board motor yacht Superfun, each deck has been carefully designed and thought out to accommodate your every need. 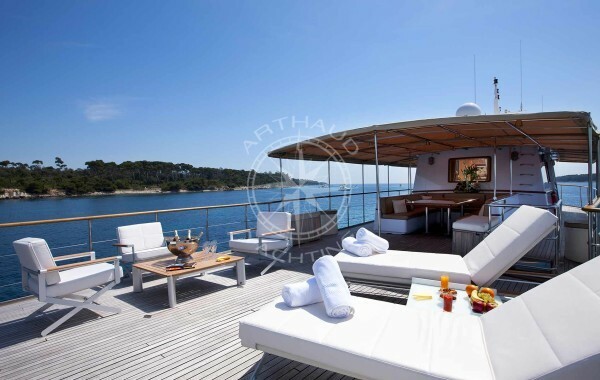 The main deck aft features a large oval table which offers a universal option for entertaining guests, or just enjoying a nice meal prepared by the chef whilst surfacing the water’s edge. 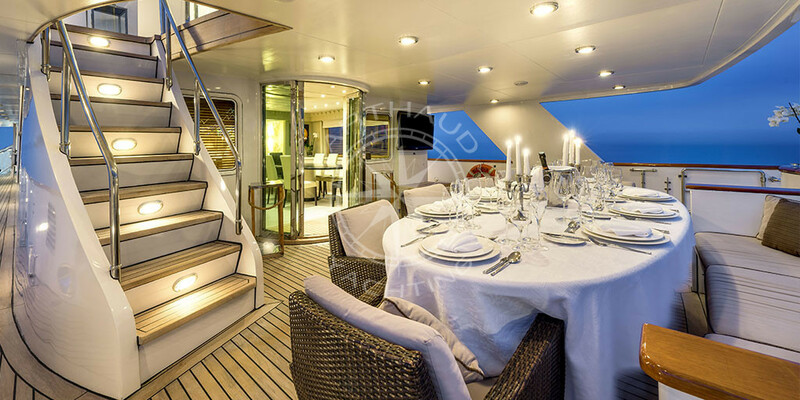 The main deck’s interior saloon serves as the main space for living, dining and lounging – a comfortable and homely area for you to spend your evenings with you family or friends. If on the contrary you are looking for a deck to escape and marvel at the beauty of mother nature, the sky deck is your go to! Offering a spacious and serene area, the sky deck features a lounging area, and sunbeds ideal to lay back and enjoy a beautiful sunset or indulge in some star gazing. 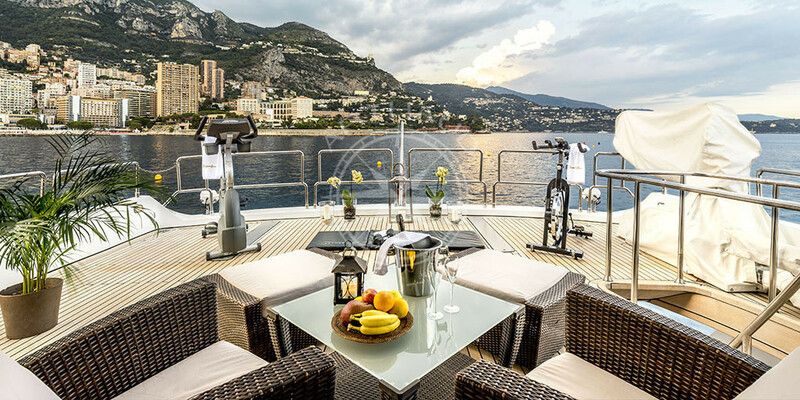 At any stage of your day, you will be sure to find refuge on one of the three decks to satiate your aspiration of a successful vacation. 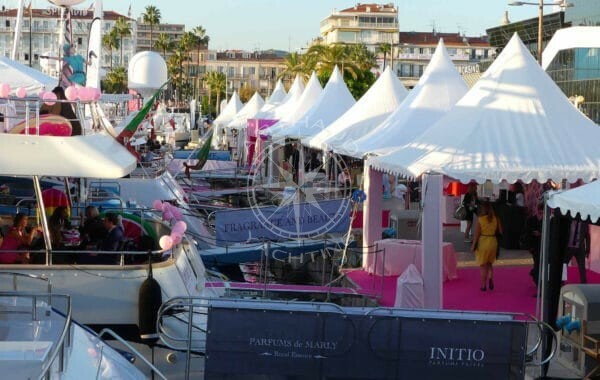 A big advantage of motor yacht Superfun is her capacity at quayside, her ability to welcome up to 150 guests on her deck galore has made her a first choice more than once during quayside events: MIPIM, Cannes Lions, Film Festival, Monaco Grand Prix, TFWA, MAPIC. Her vast deck spaces, and loose furniture present endless possibilities to tailor this luxury yacht into your very own to match your vision and colors! 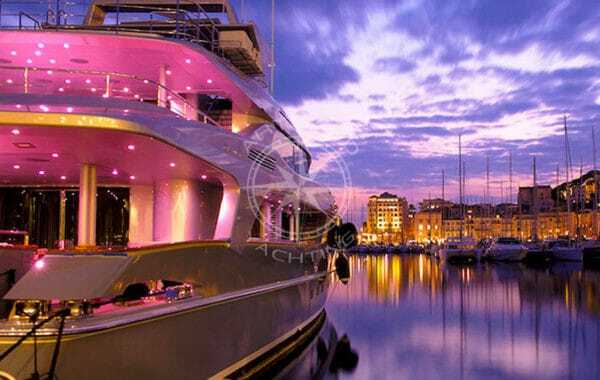 Why motor yacht Superfun? The list is long, so just hop on and see for yourself!